Making an Idiyappam from the scratch is totally fun. It will workout very well even if you make mistakes at any point of time and there is no compromise in taste too. Because of this reason, I always prefer this method. Whenever we visit our native, Amma prepares it freshly for breakfast. She serves steaming hot idiyappams with fresh grated coconut, sugar and a dollop of home made aromatic ghee. Sometimes she serves it with coconut milk also. But my sister and myself always prefer to go with earlier one. If you don't like sweet, you can prepare tomato idiyappam or tomato sevai with chopped onion, tomato, green chillies and a splash of lime. I'll be posting the recipe for that soon. 1) Soak the idly rice for minimum of 2 hours. After 2 hours, wash it well and grind it to a very smooth paste using a grinder. You can add water in between for grinding. The final batter should be thick. Don't worry if you have added more water. 2) Heat a wide pan/ kadai. Heat oil in it. Pour the ground batter and stir in low flame continuously till the batter become thick and look like a dough. After few seconds the dough comes out from the sides of the kadai. Switch the flame off. Make sure to stir continuously to avoid lumps. 3) Allow the dough to cool for sometime. Divide the dough into equal parts. 4) Coat the idiyappam press with oil. Refer the picture of the idiyappam press if you have not seen one. 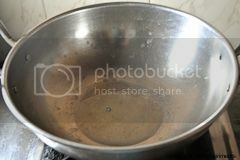 Apply oil in idly mould/ Idly cooker/ Idiyappam stand. This prevents the dough sticking from the pan. 5) Fill the dough into the idiyappam press. Close the lid and press it as noodles on the idly mould. 6) Steam it for 10-12 minutes. After 12 minutes, allow it to cool and transfer the noodles to another plate. 7) Serve hot with grated coconut, sugar and ghee or with coconut milk and sugar. 8) It can also be served with kurma. 1) The quantity given under serving is based on personal preference. It can be increased or decreased. 2) Use good quality Idly rice for pure white Idiyappam. எனக்கு இடியாப்பம்+தேங்காய்ப்பால் காம்பினேஷன் தான் ரொம்ப பிடிக்கும்.பரிமாறிய விதம் அழகு!! Healthy breakfast & neatly presented,Uma!! I too love idiyappam. Looks yum. My most favourite food, love simply with sugar and grated coconut,can have even everyday. Looks very tempting...my fav anytime!! healthy and delicious recipe... nice presentation..
Love this looks very perfect...Never tried making it this way...I usually powder the rice/use store bought powder..